Do you remember that gorgeous creamy brown chocolate called Caramac? It was one of my favourites, I've tried it again recently but didn't enjoy it, whether my tastes have changed or the recipe of the bar has changed, I don't know. What I do know is that I've never found any of the Hotel Chocolat chocolates disappointing. Always high quality chocolate and some real fun items. 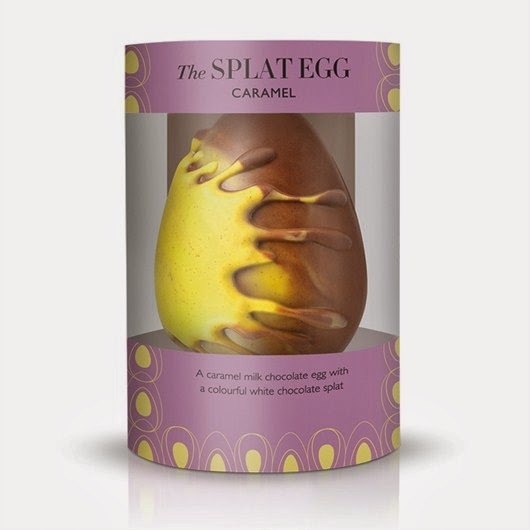 The Splat Egg - Caramel is 150g of caramel milk chocolate egg with a colourful white chocolate splat. I have one Hotel Chocolat, The Splat Egg - Caramel worth £12.50 to GIVEAWAY to one lucky reader (UK only). I Love Any Chocolate Because I Am A Chocoholic! Milk is my favourite but I'm happy with anything! I love milk and white! I like all choc, but milk is my favourite. galaxy chocolate is my favourite! my fave is milk chocolate. Ooh a nice good dark chocolate. That Looks like a fab egg! I like all types of chocolate, except the cheap stuff! I love all chocolate, of course (who doesn't...honestly?!) but at the moment my favourite is 100% dark chocolate. It's intense, rich and fruity...but worth the extra cost! I love the varieties Hotel Chocolat have especially the large bars! Belgian or Swiss is lovely-or Dairy Milk ! I love swiss chocolate, i also love chocolate orange yummy!!! I do like all choc - but milk chocolate is my fave. I love anything with nuts - praline is my favourite! i love a big slab of white chocolate! I love all chocolate, but especially dark! I love white chocolate, but if I can get white and milk marbled chocolate that's heaven! White choclate is my absolute favourite! A good quality chocolate that contains 70% cocoa solids. Dark Chocolate, pralines or champagne truffles - Yum! Any, just love choc!!!! But think milk is my absolute favourite!!!! I like any cadburys chocolate, but you cant beat mini eggs. Chocolate & caramel for me, I think they both compliment each other. Mint flavoured, After Eights, Bendicks, Matchmakers. I'm not very fussy really. I'd mix milk and white! I do adore lindt londor chocolate though! Dark, darker, darkest! Oh, and anything with nuts in it! Milk Chocolate - especially Cadburys Giant Buttons! Ooh..can't decide! Milk, white, dark- any! It's white chocolate all the way - even if it's the kids - I eat that too - nothing safe from me in the house! I used to love Caramac I think like all chocolate they keep changing the recipe. shame. Anything that Hotel Chocolat makes!! white chocolate is my favourite.